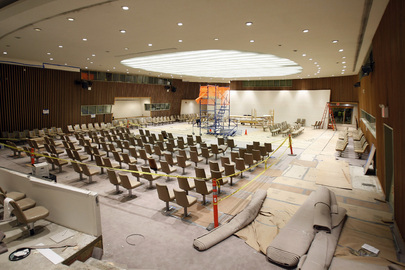 UNITED NATIONS, April 22 -- As the UN Security Council takes up the seemingly arcane subject of its "working methods," there was a development Thursday morning on the move by some Permanent Council members to give less access to the press. A convoluted series of rules, below, about how the press can use the stairs outside the Security Council, and essentially Banning the press from the Delegates' Entrance, were emailed to correspondents, on behalf of April's Japanese presidency of the Council. Spokespeople for other Council members, when shown the diktat, said it was more restrictive than they had agreed to. They pointed the finger at top UN security official Gregory Starr as responsible. We'll see, if the Spokesperson's Office answers. Spokesperson Nesirky: I told you before Matthew, that this is something that you could ask the President of the Security Council about. This is a matter for them. But, as I have also told you, we -- meaning my Office -- have a role to play in ensuring that the Secretary-General is up to speed on what is happening. And as I say, further to that, it would be better for you to speak to the President of the Security Council. Spokesperson Nesirky: If there is a development you would know about it. Meanwhile, the UN has decided to install an unmanned camera to film the entrance to the Council. But it will not have sound. Inner City Press has dubbed them "drone cameras." Thursday morning there was a delay in installation, as the single key to the now storage space under the stairs could not be found. Then when the work began it was abruptly stopped as too loud for the Council. The Press' working conditions above the library continued to deteriorate, with all phone conversations audible and the decision to cancel in-house telephone calls to UN missions in the field not rescinded. A meeting with Capital Master Plan chief Michael Adlerstein and others on these subjects, delayed so that Ahmad Fawzi's replacement Eric Falt could attend, then conflicted with a stakeout by the International Civilian Aviation Organization. Now it is announced that Mr. Falt is already leaving, to take a post at UNESCO in Paris. Bon voyage. Please find below the rules for press access in the Security Council area, including the stairs. 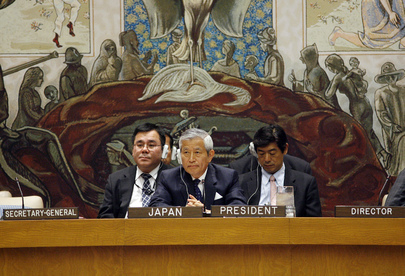 This information was provided by the Japanese Mission, which is holding the Security Council presidency for the month of April. - The press will, in principle, stay in the closed off area to the right of the stairs. agrees, the member of the press may leave the closed off area, follow that person up the stairs, turn “LEFT” to go out to the entrance and resume their conversation. - The press will not be able to go beyond a certain point from the stairs (something will be put up to indicate how far they can go). - When the conversation is over the press will go back down the stairs and go into the closed off area. - The press will not be allowed to roam around on the 1 st floor or the top of the stairs (Delegates' Entrance area), nor will they be allowed to accompany someone coming down the stairs. - These restrictions are all for safety reasons. - The Kuwaiti boat area (the area to the “RIGHT” of the stairs if you are going up) will be for delegates only. Ah, safety. One wondered how this would be policed: with ankle bracelets on the journalists? Watch this site.